Joining local tour is another option, but many local tour companies are very expensive. Self-arranged tour is much cheaper but self-arranged visitors should have adventurous mind-set. 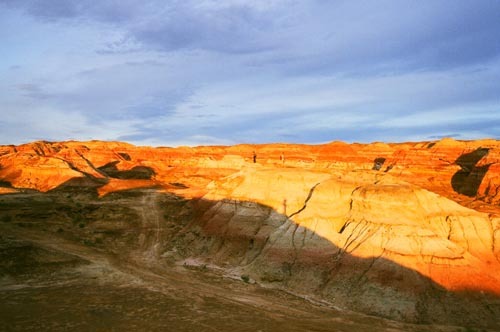 We hope this article can provide some useful first-hand information to North Xinjiang visitors. Horse/Hiking Tour Organizer: Mr Yang Tianxiong +86-906-13899415354 or phone 86-906-6322897. 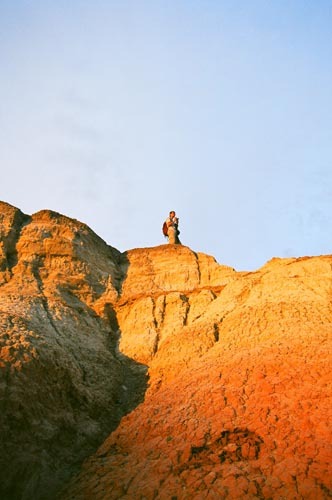 He has five-year experience in travel guide for Kanas self-arranged tour. He lives in Jiadengyu and his narrative is Han. He is good at both Chinese and local language〞Hasake. The price he could offer you is fairer than other local guides there. 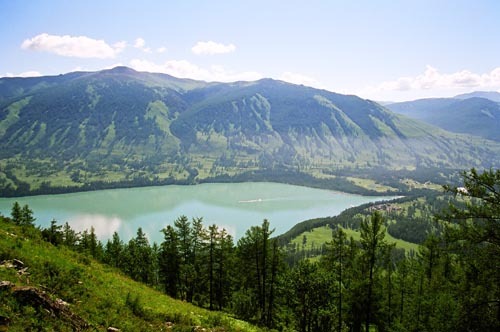 Kanas (喀納斯) is famous for her natural beauty e.g forrest, rivers, lakes, mountain etc. 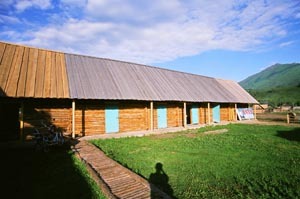 Kanas is connected to Altay by a newly paved road. Some people opt to overcome 32km of mountainous footpath to Kanas from another village called Hemu (和木). 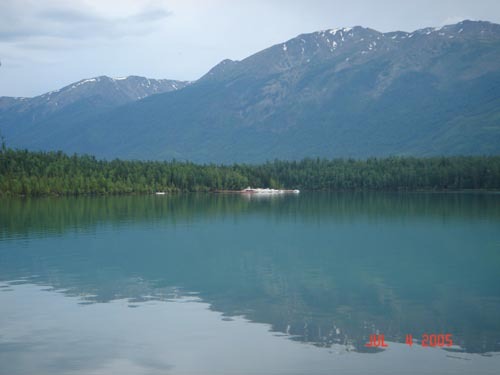 The right picture is a view of Hemu, it is a rather primitive village. It is not attached to power grid, it lives on solar cell panels and small diesel generators. There are two main ways of going to Hemu. One is take a car from Altay. At the time of this writing, road to Hemu is still under construction, thus a jeep is recommended. 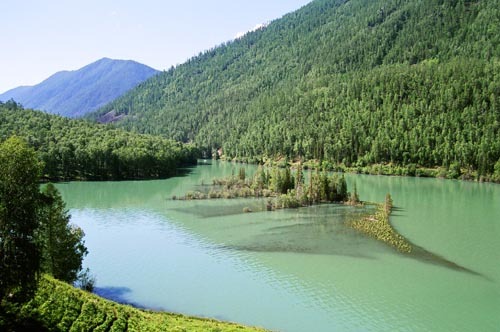 Or you can start the tour at Jiadengyu, you could save entrance ticket (RMB100 at Kanas or RMB60 at Hemu), then you could pass through virgin forest and reach at the best location LIANG HE JIAO HUI (which is cross area between Kanas river and Hemu river)for photographer fan. Some people walks from Hemu to Kanas, some will choose to ride on horse back. In either case, you need two days unless you are a proficient jockey. You can pick up horses and horseman in Hemu. Reference price: RMB100 for each horse per day, RMB50 for horseman per day. Besides acting as a transit point, you can also do fishing in nearby river. Villagers told me that fish there is easy to catch. You can bring your catch to the Inn, the staff there will cook for you in return for some cooking fee. In autumn time, the nearby mountain and forrest exhibit captivating golden colour. 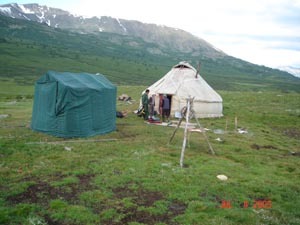 There are some basic accommodation in Hemu (see below left), no private washroom, no air-con. 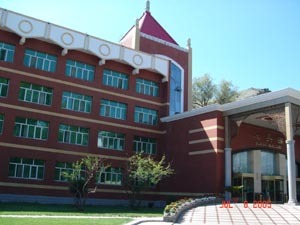 Reference price: RMB70 per bed per night. 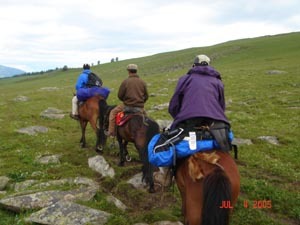 While you are riding or hiking on the mountain ridges, do expect unexpected weather changes. During our 2 days ride on the mountain, we experienced strong sunshine, torrential rain and hail storm. Your backpacks need to be wrapped in waterproof plastic bags and your clothing need to handle multi-climate situations. We stayed in a nomad tent for a night. 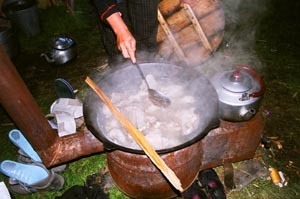 We tried the famous Xianjian dish, Hand Torn Meat(手爪肉), served by the nomads. It is actually a freshly kill goat boiled in water. Although the cooking is relatively simple, it is surprisingly tasty. There is another angle to look at the lake, i.e. from the above. 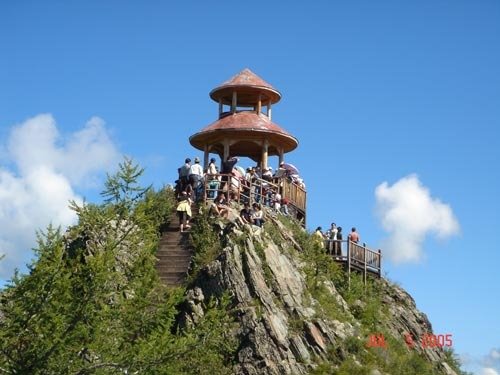 You can take a shuttle bus and do some hiking to reach the Watch Fish Tower (觀魚亭). This tower is normally crowded with visitors. Some enthusiasts hikes to the Tower in early morning to shoot pictures of morning flog lingering on lake surface. The morning flog will disappear soon after direct sunshine reaches the lake area. Morning flog does not show up every day, right temperature and humidity are essential. 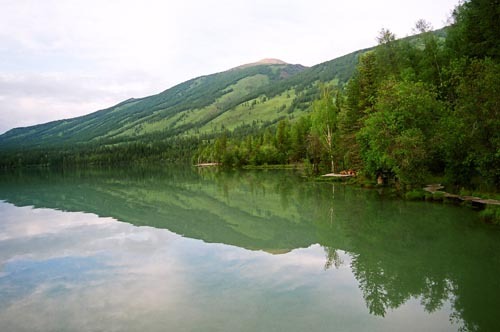 There is a river leaving the Kanas lake. 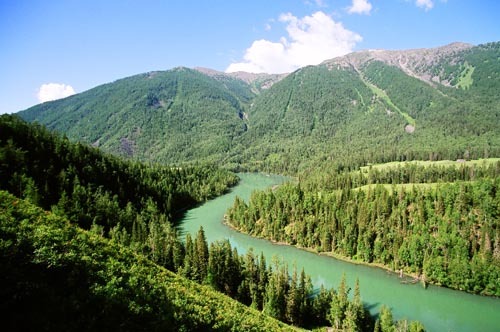 The winding river passes through some wonderful scenic lookouts. The right one is called The Crescent Bay (半月灣). The one below is called The Bay of Crouching Dragon (臥龍灣). 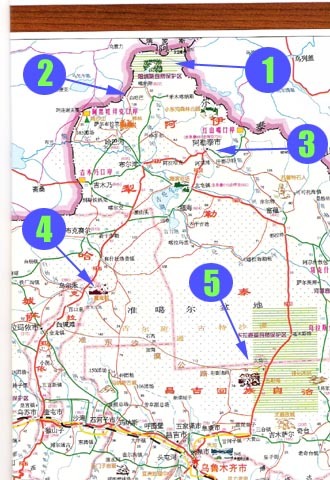 White Haba village is right next to Russia across the Russian-Chinese border. There is no mobile phone coverage. The village is mainly dwelled by minor ethnic groups. There are some basic inns for tourists. Reference price: RMB10~20 per bed per night. 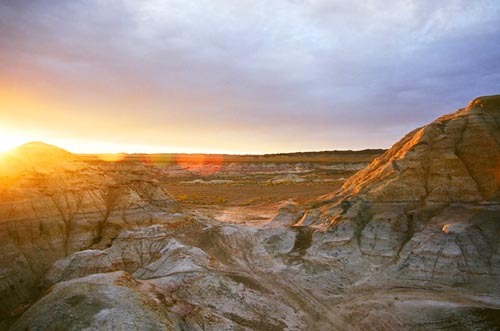 To come here, a jeep is recommended. 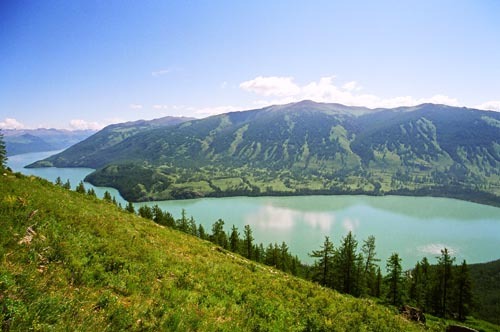 There are quite a number of tourist attractions in greater Altay Area. 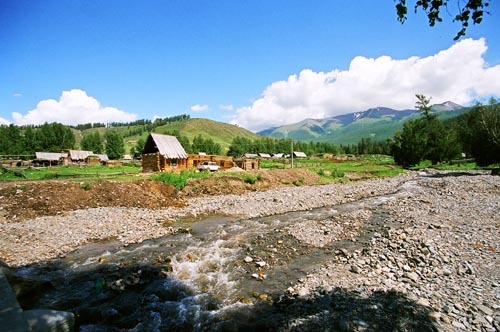 Most of them can be reached within 3hrs drive from Altay down town. We only managed to visit two of them (Location Y and Z). 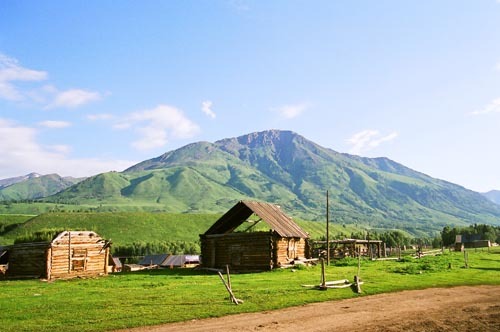 It is recommended to spend two full days in Altay to explore Altay to a fuller extend. 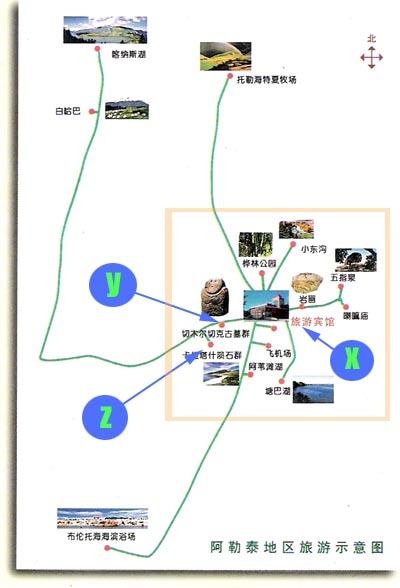 We stayed in Tourist Hotel(旅遊賓館) which is a three stars hotel marked as X in the map. It is a very convinent hotel, there are a number of restaurants nearby. More importantly, there are many charter vehicles (both sudan and 4-wheel drive) right next to the hotel. 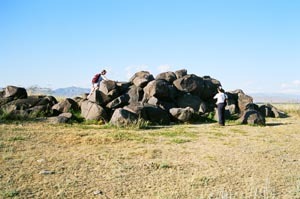 The erected stones were carved with human faces however the carving was somewhat eroded by weather and human contacts. Unfortunately, when we arrived there, it was sun set time. The faces were in shadow. 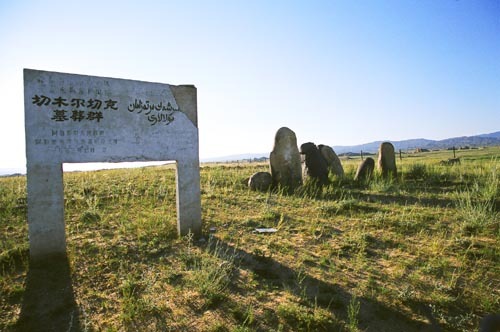 The stones are quite far away from the main road. You really need a jeep to bring you through the jagged land. This is a pile of meteorites by the road. The meteorites are of metallic nature. If you pound the meteorite, it will give you metallic sound. Please press the play key to hear the on-site sound record. 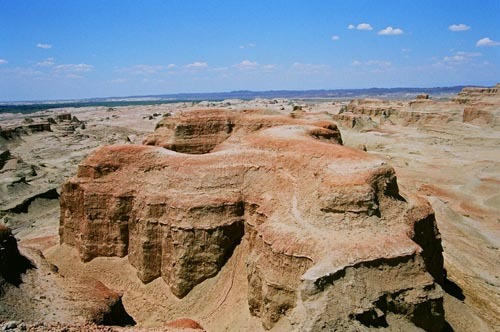 Devil City located in Xinjiang Karamay, about 6km northeast of Wuerhe area. 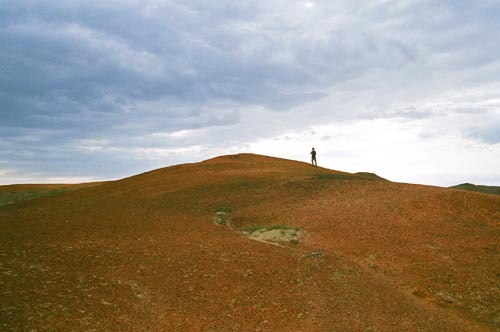 In former Cretaceous period of more than 100 million years, it is an enormous Lake. 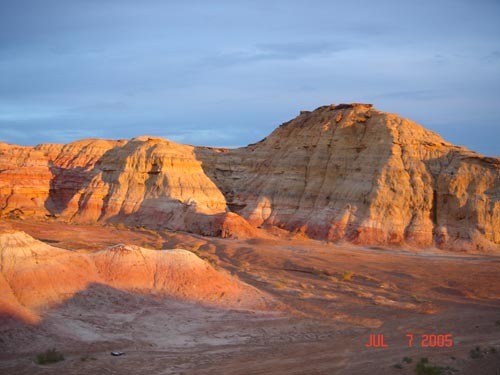 Thus many fossils of sea creatures were found in this area. 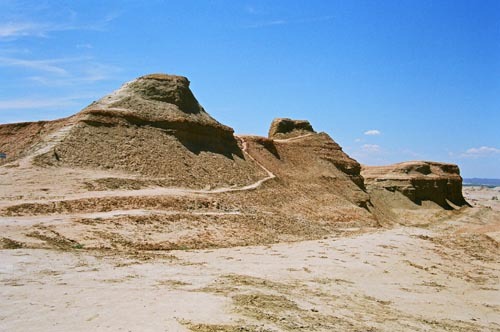 Devil City was covered by weird-looking rocky structures, some take the shape of budda, animals, human beings and even temple. When strong wind blows inside the "city", it generates some horrific sound just like the crying of devil. That's why it is dubbed Devil City. Five Color City (五彩城) is not city of people, it is a city of beautiful rocks. 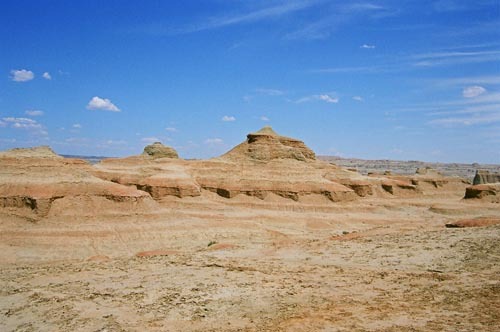 It covers a vast area in the desert. 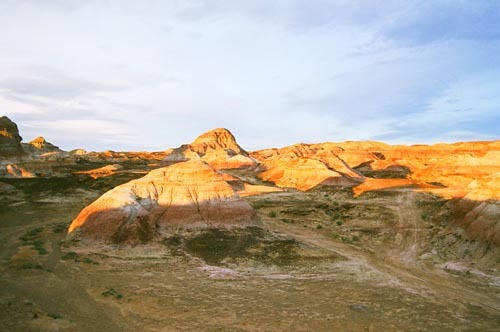 To go there, a jeep is highly recommended because it is located almost 2 hours from the main road on some barren and rough terrain. 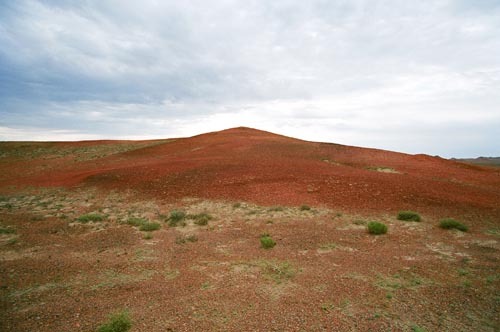 This area is composed of layers of red rocks. Under the illumination of evening sun, the Five Color City is so splendid that it goes beyond the description of words. Burnt Mountain (火燒山) is located next to the Five Color City. The landscape here is less chaotic and is much closer to the main road. 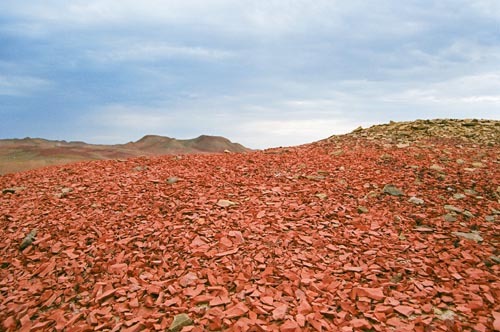 It is covered by red stones. It was once a coal mine area, for some reasons, the mine was one fire. This are is thus dubbed as Burnt Mountain (火燒山).